There are a lot of choices in all weather garden furniture, with some claiming to be a bit better than they actually are. The quality can vary greatly between brands, and I’m sorry to say that you definitely get what you pay for. We are going to be going through the best and the worst, as well as where you should buy them, and what sort of weatherproof guarantee you should expect them to come with from the retailer. If you’re in the UK, and looking to change up your garden furniture, then stay put, because this is where you want to be! Let’s be honest, this is always the most interesting read, so I’ll start with the worst providers, those whose quality doesn’t last, and isn’t value for money. To skip to the best providers, click here. You may have seen these in your local B&Q or Homebase, it’s the furniture that looks like hand woven rattan, but it’s actually a hard plastic shell, a single piece instead of multiple threads. This creates a hard, unforgiving chair, but that’s not the subject of this article. The plastic is prone to cracking, and fades very quickly when left in the sun, as it hasn’t been UV stabilised. The frames are often steel, which rusts very easily when left outside, and leaves you with a weak chair prone to breaking through at any minute. You can read an interesting Polywood furniture review here. We would advise against the purchase of Polywood, because it isn’t proven to last outside. Here we have the highest quality providers, including brands that are good value for money, and have proven that they’re all weather, not just for the first year of purchase. As mentioned above their are various “wood effect” style furniture ranges out there at the moment. However one that really stands out as high quality is the range from Winawood, a brand from Innovators International. It’s a compressed polystyrene material, but don’t let that put you off, as it creates a wonderful grain effect, that looks and feels like real wood. However this furniture is completely weatherproof, and will not warp, rot, or go brittle when left outside, whether that’s the sun or the cold and ice. More info on Winawood can be found in the video below, or you could visit the official website winawoodfurniture.co.uk, or the place for build instructions and other info buildwinawood.co.uk. 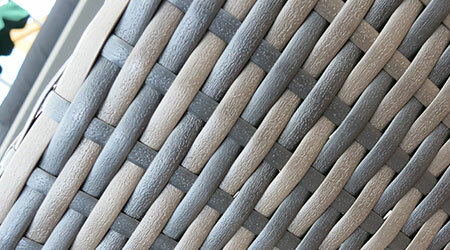 This is an example of how hand woven synthetic rattan actually looks, it’s noticeably different from the plastic shell pieces mentioned in the worst section. It has a “give” when you sit down, cushioning you gently which is a wonderful way to sit in my opinion! As we all know aluminium cannot rust, and so this frame will be strong for years to come, even if you leave it outside. The rattan is UV stabilised, which means it’s been treated to withstand the damaging effects of the sun, and so will not fade, rot, or go brittle. The only thing you need to do is jet wash it every now and again to clear and debris in between the threads. 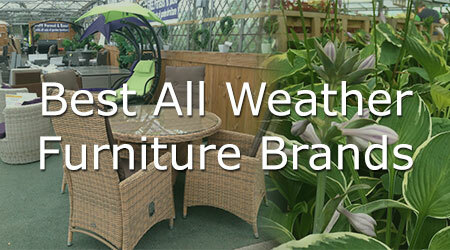 Well that’s it folks, I hope you’ve found our all weather furniture round up useful. If you have any questions or comments please add them to the comments section, or email me. If you’re interested in reading up on some of the sources of this article, then I’ve included a list of references below. Also checkout our gardening resource page. Happy gardening! Last edited by David Thompson, in Newcastle on the 23rd of January 2017.
asapharrow.org.uk © 2019. All Rights Reserved.